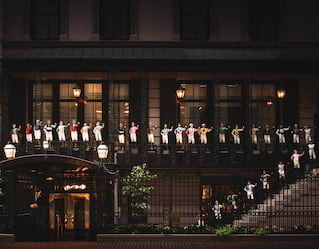 When the doors first opened on January 1, 1930, few could imagine that '21' would become one of the most famous speakeasies of the Prohibition Era. Over 80 years, we’ve charmed celebrities and captains of industry alike. Step inside today, and you’ll find a space that’s alive with history. Our wrought-iron gate is an icon. 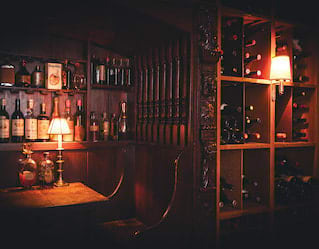 It dates back to 1926, when founders Jack and Charlie moved their Club Fronton from 88 Washington Place to open the Puncheon Grotto at 42 West 49th Street. No sooner had the doors opened when they received notice that the Rockefeller Center was to be built on the site. On January 1, 1930, they unhinged the gate from the doorway of No. 42 and installed it three blocks north at 21 West 52nd Street. '21' was officially opened. Art is integral to the spirit of ‘21’—Jack and Charlie were enthusiastic collectors from the start. Several pieces were acquired during the Great Depression as settlements for sizeable bar tabs. Throughout ‘21’ you’ll find original works from Frederick Remington, McClelland Barclay and Bradford Crandall, cartoon dedications from Walt Disney and The New Yorker’s Peter Arno, plus modern collections from Francesca Anderson and Wynne Evans. 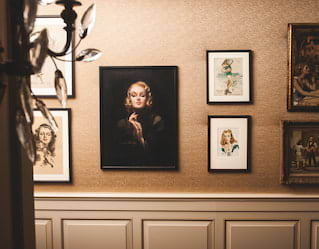 '21' has been frequented by some of the world’s biggest stars. The Iron Gate yearbook is packed with some of their tributes, including the one above from Bob Schieffer. A 2.0 version was published to commemorate our 80th birthday. Prohibition forced Jack and Charlie to hide their liquor. They employed Frank Buchanan to design a system of camouflaged doors, invisible chutes, revolving bars and a secret wine cellar. The cellar was actually part of No. 19 next door, so staff could honestly say there was no alcohol on the premises. It housed 2,000 cases of wine, including the private collections of Presidents Gerald Ford and Richard Nixon, Elizabeth Taylor, Sophia Loren and Aristotle Onassis. 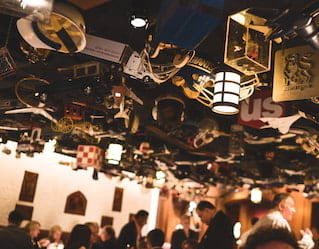 Look up in the Bar Room—you’ll struggle to find a more unique ceiling anywhere in the world. Every inch is filled with sporting goods and industrial memorabilia, all donated by patrons. There’s a model of a PT-109 torpedo boat from President John F. Kennedy, a baseball bat from Willie Mays, a replica of Air Force One from President Clinton, tennis racquets from Chris Evert and John McEnroe, and even a golf club from Jack Nicklaus. 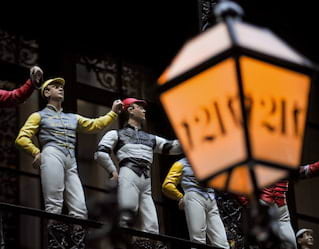 Standing guard on the balcony above the entrance to ‘21’ is a group of ornamental jockeys, donated by some of the best-known stables in American thoroughbred racing. Sportsman, entrepreneur and long-time patron, Jay van Urk, presented '21' with its first jockey in the early 1930s. The quirk caught on, and donations from the likes of the Vanderbilt, Mellon and Ogden Mills Phipps families soon followed.